Anyone who has restored an old home can tell you no project is as ever simple as you think it will be. Jen and I spent the last 12 years fixing up an 1,100 sqft 1956 pier and beam house in San Marcos, TX. It had been added on to a couple of times, including turning what was once probably a slab patio into an extra room. The little house had great character including original wood floors, probably southern long leaf pine. It had a funky old metal roof and a big 3/4 acre yard. One of the first things I did was add a garden and plant fruit trees. That project went as planned. Few others did. Twelve years, one half-bath, two tiled bathrooms, one tiled room, one bathroom remodel, one travertine tile shower, one new AC/heatpump and all new ducting, one completely remodeled kitchen with restored pine floors, ten new windows, one two-car garage, new hardiboard siding, one insulated attic and walls, one greenhouse, one 10×20 foot shed and one wooden playscape later, and it’s perfect. So we moved out and started again. I’m told the Naivar Farm house is probably from the 1800s. Yes, over 100 years old. In that time I know it has been relocated to make way for gravel extraction, multiple rooms have been added, the kitchen moved from the front to the back of the house, a second story was removed (yes, physically removed and the roof lowered), and according to my friend Jeff who knows about such things, it had one of the first styles of electrical system run in domestic buildings (the bare insulators still in the attic attest to it). No project in this house has gone as I’ve planned it. All of them have had delays, additions, subtractions, advances and retreats. Wiring a 220 receptacle for our dryer took over a week and probably 20 trips under the house. Climbing under the house gets old after about 3 trips. Twenty is torture. And I still have to make one more because I think I dropped my wire strippers down there. Sigh. But the projects do get completed. I planned and installed a four-strand barbed wire fence with three entrance gates on the front of the property. I think even with four people working on it if took us months. The drier is running; the washer has a new GFCI grounded receptacle. The garden is in; the fig trees are planted. Projects do get completed. They just take longer than you plan. Always. Next up, complete bathroom remodel. What could go wrong?! The Future Face of the Farm? Is this cute looking guy the future face of the farm? 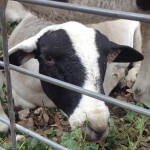 It’s a certified dorper sheep raised by The amazing folks at the Roeder Ranch. They have a 1,600 acre ranch west of Fredricksburg that has been in the family since the late 1890s. Brad and his parents were nice enough to have my brother Dewayne and I out for a visit Sunday. They patiently answered all of our questions, even the dumb ones. They really got us excited about raising sheep. And more importantly, the got us believing we can actually be successful at it! So, we’re now in the process of putting our business together. FEINs, LLC paperwork, bank account, farm tax IDs, business plan, website, social media and all that fun stuff. We get to employ everyone’s skills. Dewayne’s MBA, Jennifer’s ability to be organized and keep everyone on task, and my…my…hmm. Well, I’m sure I bring something to the table. Manual labor? East austin hipster vibe? Geeky web powers? I’m sure something will rise to the surface. So, I hope everyone is hungry. 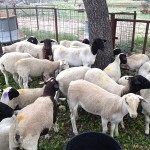 We plan to offer some if the best grass fed lamb central Texas has ever laid a fork to! And that’s just for starters. Want to get in on the woolly action? We’ll be up for trading manual labor for shares. We’ll have plenty you can help us with. 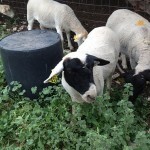 Dorper sheep from Roeder Farm. 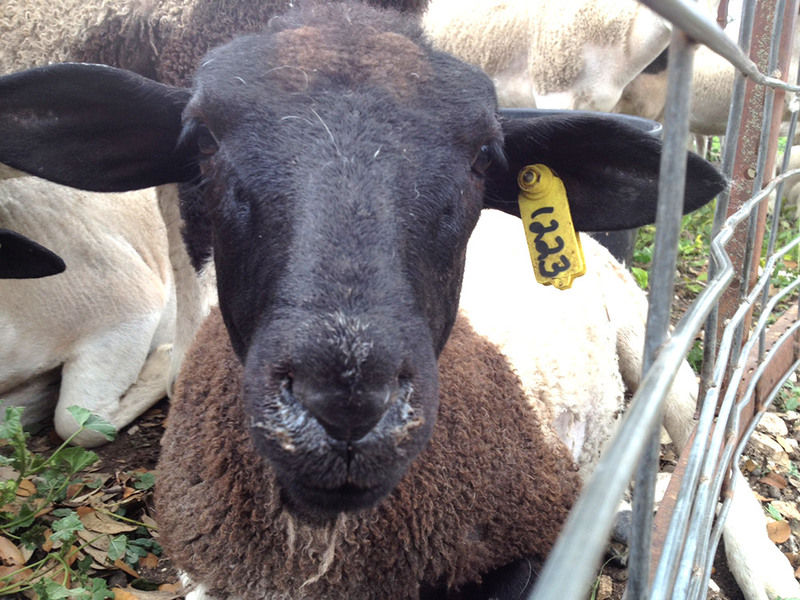 Dorper sheep with their new ear tags. Dorper sheep with their sporty new hair dye. I had a knock at the door this afternoon from the man that leases the land for coastal hay. 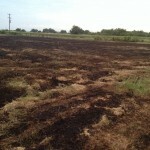 His baler had caught the hay on fire which subsequently caught part of our pasture on fire. 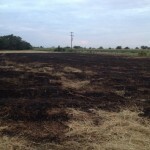 He dumped his burning bale of hay and drove up to the house and we put out the fire that was still smoldering in his baler. Seeing as how it’s a $45,000 piece of equipment you really don’t want to see it burn to the ground. 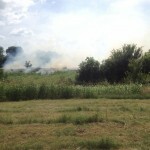 Across the road, about 200 yards away, I could see great clouds of white smoke pouring off the pasture. 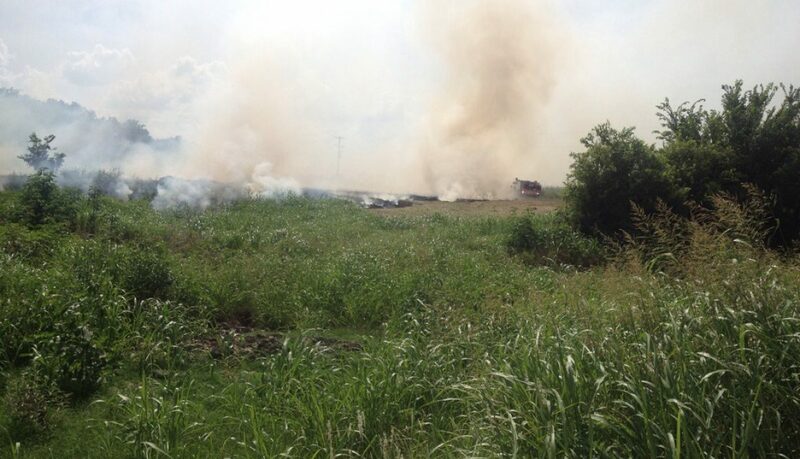 I called the Granger fire department who told me I needed to call Williamson County 911 before they could be dispatched. What?!? So I dialed 911 and the Granger volunteer fire department was here within about 10 minutes. I strapped the two girls in to the Subaru and drove down to open one of the gates so they could get in the back way. I then had to head back up to the house because babysitting in a smoky field was no ones’ idea of fun. Well, I thought it was fun but Amelia disagreed. At some point the Sheriff arrived and left. I wasn’t able to watch the progress. I think it took about 30-45 minutes to put the fire out. You can see the fire truck on the right. It’s made for grass fires and sprays water from the front and back at the ground. 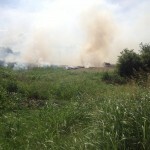 The fire is burning down in to the wet weather creek bed. Hard to believe there is something dry in all that green.